You’ve probably heard that magazine journalism is a genre whose time has passed. That long-form writing is being made obsolete by Twitter. That the future belongs to cable news shouters. At TNR, we beg to differ. We’ve always thought that carefully crafted magazine journalism had an appeal that was not going away. And now we’ve designed a stunning iPad app to prove it. We put together our app with a simple idea in mind: that the old values of magazine journalism—deep reporting, beautiful prose, long-form argument and narrative—were a perfect match for this new medium. And so we conceived of our app as a daily magazine. It is meant to create the experience of receiving a print issue of TNR in your mailbox, if a print issue of TNR were to arrive every day. Unlike other magazine apps, ours isn’t just an identical copy of our print product. It takes all our pieces, from both our web and print editions, and assembles them daily into a magazine format. 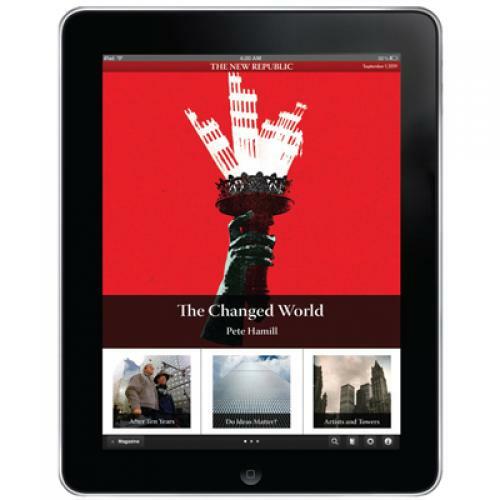 We think the iPad is the perfect medium in which to read not just long-form content from our print magazine, but also the long-form pieces that we regularly feature on our website—plus our daily columns and articles, our witty and brilliant blogs, and amazing pieces from our 97 years worth of archives. If you are someone who loves true magazine journalism, we’ve designed this app with you in mind. And we hope you’ll join us by subscribing to it.